The garden is one of the most beautiful and important parts of the house that throbs with lively activities of plants, small animals, birds and insects. Most often it becomes the habitat of some unwanted species like bees or wasps. They build hives and grow in number in a matter of few days and can pose serious threat to the members of your family, especially children. Not only is their sting poisonous and dangerous, but stepping on their lifeless bodies barefoot can cause instant swelling that may take days to recover. Hence this is a pest control problem that should be taken care of as soon as possible, before the swarm can expand and occupy other places. We asked specialists from waspremovaltoronto.ca to tell us how to deal with the problem. Wasps and bees have certain characteristics that should be taken of advantage of, in order to keep them away. These insects are territorial and instinctive in nature, and hence certain illusions can work against them. Painting the possible hive spots blue will trick them into confusing the spot with the sky, whereas hanging crumpled paper bags in certain spots will trick them into believing that another hive exists, and their territorial nature will make them to move on. However, these approaches are still risky, hence more practical methods must also be applied. Bug sprays or linseed oil can be applied to the plants and open water sources should be removed as these insects tends to build their hive around a source of water. One certified way to limit the population of wasps and bees is keeping a jar filled with honey or mead and water in open air. The lid of the jar should be punctured with a metallic object, such that the inside of the lid becomes jagged due to the protruding metal. The holes should be large enough for bees and wasps to enter. The insects will be attracted to the content of the jar and feed on it, but will be unable to escape since the sharp metal protrusions will trap them in the jar where they will drown in the water. But this method may kill the insects, which should be avoided to preserve the natural habitat. Bees and wasps are generally attracted to flowers that have strong aroma and dark colors like violet and purple, hence removal of these plants will not invite them either. 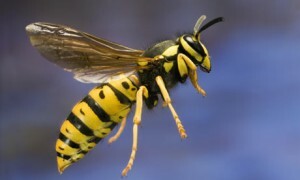 You can read more about wasps and other pests at the per-eminent Canadian pest control blog.